Lombok Island in Indonesia does not have only the beach and Gili. In fact, it is the home of a famous vacation destination called Mount Rinjani National Park. As the name suggests, it is the part of the grandiose Rinjani Mountain and becomes the home of tons of plants and trees. As for tourists, the site becomes a suitable location to conduct exploration and learn many species of tropical flora. Somehow, it is popular among families with kids. On top of that, visitors can enjoy trekking during the exploration. In a nutshell, Mountain Rinjani National Park consists of several landscapes including the rainforest, savanna, and mountains. The size of the size is more than 41,000 hectares, in fact! Another fact is that the site resides on 2800 meters above the sea level and it even features a dead crater (Segara Anak Lake) of Rinjani! Another important trivia is that there is Senaru Gate where tourists can start their adventure in this vast natural park. It also becomes the checkpoint for those who want to perform trekking. Aside from the abundant plants and trees, though, the park also features various kinds of tropical animals. 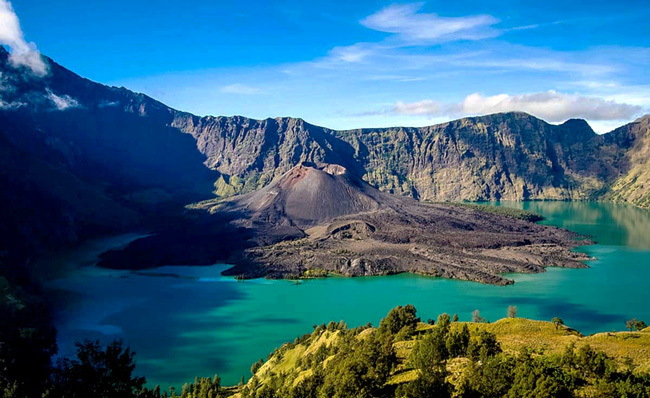 It is, without a doubt, the most popular activity to do in Mount Rinjani National Park is sightseeing. This means tourists can explore the park (as long as they have enough stamina) and witness lots of variety of plants and animals. The most famous floras include Banyan, Duren, forest orchids, Bayur, etc. As for the faunas, tourists can find deer, tropical birds, reptiles, and some fishes like carps in the nearby lake. Aside from witnessing the richness of flora and fauna, other fun activities are available including the local myth related to the site. According to the locals, there was a beautiful goddess named Anjani. Being aware of such mythical legend, villagers often come to the site to conduct a ritual. They offer small gold bars to the goddess by throwing them to the Segara Anak Lake. As for tourists, they can witness such ritual as long as they come at the right time. In this case, it is recommended to come with a local guide. As for the tip, make sure to come between August and December every year. The first reason is that the weather is the nicest to explore the Mount Rinjani National Park. Second, it is the time when the locals often conduct traditional rituals Topat War Performance and an offering ritual for Anjani Goddess. Once again, it is better to hire a local guide to decide the right time to visit this famous national park. From the capital of Lombok (Mataram City), travelers need to take a trip for about 4 hours as the distance is 109 km. It can be done through Raya Mataram – Labuan Lombo Street, actually. The trip can be faster if they take a better transportation service or even a private car.